STOP IT RIGHT NOW: DEAL OF THE WEEK! balmain puts me into a blind rage. "guys how much should we charge for this one?" "well lets see there are like thirty rips on it and like 100 safety pins so times that by and carry the three plus the difference over 2 carry the four... $2570!" but wait, if you do it for 50% of the price, will you earn anything from it? 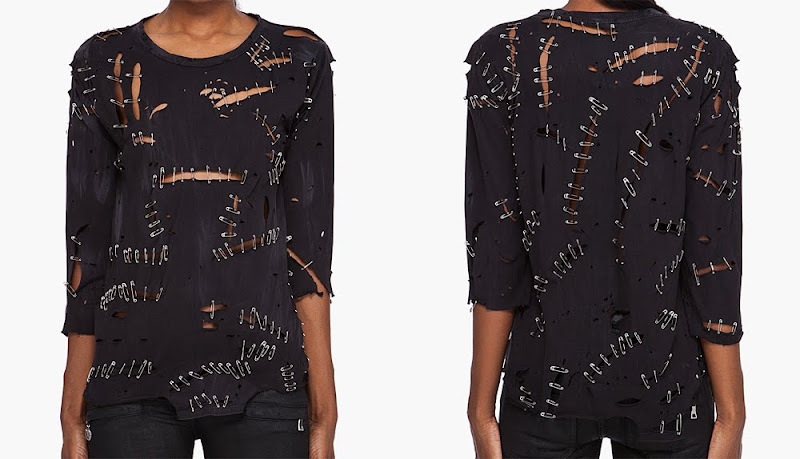 i mean, it must be so expensive yo buy safety pins, right? right? or maybe those are made out of silver? haha tell me you saw me post this on twatter a few weeks ago.. otherwise once again ESP. some people just take the piss and seem to get away with it. Yeah, I don't even get that. 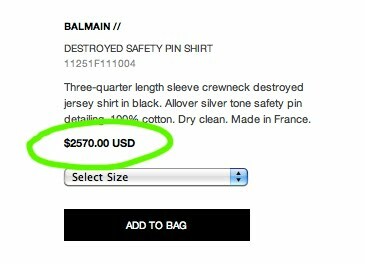 I was at Nordstrom's Rack the other week checking out things and saw the "discount" Balmain stuff. It's totally beyond me that people will pay that. a purchase like this can't possibly be a good investment for ANYONE. i looks like something i'd whip up an hour before going out on Halloween dressed as Freddie Kruger.